Elizabeth Bassett Proctor (1652-17??) – Both Elizabeth and her husband, John Proctor, were accused of witchcraft, tried, and sentenced to hang. Elizabeth was born to William and Lexi Burt Basset in Lynn, Massachusetts in 1652. She grew up to marry John Proctor, who was some 20 years older than her, on April 1, 1674. John, who had been married twice previously, was already well established, living on the Downing farm on the outskirts of Salem, in what is now known as Peabody. He also owned a tavern on Ipswich Road in Salem, which Elizabeth would help him manage. The couple would eventually have six children. In 1692, when the witch hysteria broke out in Salem Village, John Proctor was a successful farmer and entrepreneur who had never been involved in Salem Village politics, nor was he involved in any litigation or disputes with the powerful Putnam family, who was behind many of the accusations. However, his interests were diametrically opposed to those of the old, established Salem Village elite and he was an “outsider.” And, by some accounts, he was said to have been a part of what was called the “Anti-Parris Network” led by Israel Porter, who was a major enemy of the Putmans. Elizabeth was at risk of being targeted because her grandmother was Ann Holland Basset Burt, a Quaker and a midwife, who was brought up on charges of witchcraft in 1669. As she was not a doctor, but, was successful at curing the sick, some people felt she could only have medical skills if she were a witch. Though no action was taken against Ann Burt, this type of scandal was not easily forgotten in Puritan New England. Besides the accusal of her grandmother, the Puritans, in general, felt there was something “witchlike” about Quakers, and because Elizabeth had family who were Quakers, this would make her suspect in the eyes of many. In March 1692, things began to unravel for the Proctors. After an arrest warrant was issued for Rebecca Nurse, an elderly respected member of Salem Village, on March 23, 1692, John Proctor was enraged, saying: “If the afflicted girls” were let alone, so we should all be devils and witches.” Rebecca was related by marriage to John Proctor. Though some residents agreed with John Proctor, doubting whether the “afflicted girls” should be believed, they wouldn’t say anything, for fear that they might be accused and convicted themselves. However, this didn’t stop the outspoken Proctor, who was the first to speak out, voicing his opinion of the possessed state of the girls, their accusations, and standing up heartily against the trials. It would be a fatal mistake. At about the same time, a servant of the Proctors’, Mary Warren, began to have fits, saying that she was “seeing” the specter of Giles Corey. Dismissive of her claims, he simply made Mary work harder and threatened to beat her if she had any more fits. For some time, Mary did not report any more sightings, but, then she started to have fits again in his absence. Warren was kept hard at work at the Proctor home and was told that if she ran into fire or water during one of her fits, she would not be rescued. After her “fits” stopped, she posted a note at the Meeting House to request a prayers of thanks. That very night, Mary said that Elizabeth Proctor’s spirit woke her to torment her about posting of the note. On April 3, 1692, Samuel Parris read Mary’s note to the church members, who began to question Mary after the Sunday services. 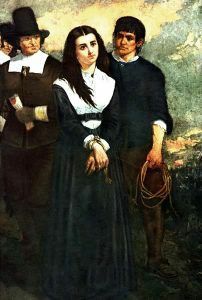 In the meantime, Mercy Lewis and Abigail Williams were also making accusations against Elizabeth Proctor and on April 8, 1692, a complaint was filed by Captain Jonathan Walcott and Lieutenant Natheniel Ingersoll, both of Salem Village, which accused Elizabeth of committing witchcraft upon Abigail Williams, John Indian, Mary Walcott, Ann Putnam, Jr. and Marcy Lewis. She was examined, indicted, and sent to jail on April 11th. During the examination, the Proctors’ 20-year-old servant, Mary Warren, testified that Elizabeth tried to make her sign the “Devil’s Book.” Both Abigail Williams and Mercy Lewis would say that they were being tormented by Elizabeth’s specter, and Abigail Williams would further say that the specter was pinching her and tearing at her bowels. To these accusations, Elizabeth would say “I take God in heaven to be my witness, that I know nothing of it, no more than the child unborn.” During her examination, her husband John defended her and said that the girls were hallucinating and the information they gave was false. As a result, the “afflicted girls” also accused him, and he too was sent to jail. Elizabeth was sent to the prison in Boston. Later that month, 31 men from Ipswich, Massachusetts, filed a petition attesting to the upstanding character of John and Elizabeth Proctor, denying that they had ever seen anything that would indicate they were witches. The following month, another petition was filed on behalf of the Proctors which included 20 signatures of men and women, some of which were from some of the wealthiest landowners of Topsfield and Salem Village. This petition questioned spectral evidence and testified to the Christian lives that John and Elizabeth had led. On June 2, 1692, a male doctor and several women completed a physical examination of Elizabeth and several of the other accused. They looked for birth defects, moles or other markings that they believed were a sign that the person was a witch, and found none. On August 2, 1692, the court met in Salem to discuss the fate of John and Elizabeth Proctor and several others. At some point during this time, John wrote his will, in which, he did not include his wife Elizabeth. Though the reason that he did not include her is unknown, many historians believe this was because he assumed she would be executed along with him. On August 5, 1692, John and Elizabeth Proctor were tried, convicted, and sentenced to be hung by the neck until dead. On August 19, 1692, John Proctor was hanged on Gallows Hill in Salem, along with George Burroughs, George Jacobs Sr., John Willard, and Martha Carrier. Elizabeth; however, would not immediately be hanged because she was pregnant. She would give birth to a son, she named John after his deceased father, on January 27, 1693. By this time, the witch hysteria had died down and her execution wasn’t followed through. Elizabeth and John Proctor, III remained in jail until May 1693, when Massachusetts Governor William Phips ordered a general release freeing all of those prisoners who remained jailed. However, before she was released, her family was required to pay her prison fees. At this time, families were required to pay for their family members room and board while in jail, as well as the cost of John’s execution. Though she was finally free, her torment was far from over. She had no home to return to, as all of their possessions had been seized after they were convicted. Further, because her husband, John, had left her out of his will, she would not claim any of the property. Adding to her turmoil was the fact that she had been convicted, which not only made her a pariah to the locals but, in the eyes of the law, she was considered a “dead woman” and could not claim any of her husband’s estate. She, her children, and stepchildren were impoverished. She and her children then lived with her step-son Benjamin Proctor. Elizabeth petitioned the court for a reversal of attainder to restore her legal rights. However, even though it was now widely accepted that innocent people had been wrongly convicted, no action would be taken for several years. In June 1696, Elizabeth filed an appeal to contest her husband’s will, but, what became of this is unknown. Initially, because she no longer existed legally, she could not even regain her dowry. Finally, on April 19, 1697, the probate court at Salem ordered the Proctor heirs to give Elizabeth her dowry. On September 22, 1699, Elizabeth married her second husband, Daniel Richards, in Lynn, Massachusetts. The public demanded that the courts apologize, and a written apology was issued on March 18, 1702. In July 1703, an address was made to the General Court requesting the petitions from the families be granted. Finally, action was taken to obtain the reversal of attainder for Elizabeth. However, they only gave reversal of attainder to those who had filed petitions, which applied to only two people – Elizabeth Proctor and Rebecca Nurse. In 1705, another petition was filed requesting a more equitable settlement for those wrongly accused. Four years later, in May 1709, the General Court granted both a reversal of attainder and compensation for financial losses for an additional 22 people who had been convicted of witchcraft. On October 17, 1711, the General Court passed a bill reversing the judgment against the 104 people listed in the 1709 petition. There were still an additional 7 people who had been convicted but had not signed the petition. There was no reversal of attainder for them. A few months later, on December 11, 1711, monetary compensation was finally awarded to the 22 people in the 1709 petition. Most of the accounts were settled within a year. The award to the Proctor family for Elizabeth was about ₤150, one of the highest amounts paid. It was only exceeded by the amount paid to Salem merchant, Philip English, whose 4 warehouses had been stripped of all goods and whose ships had been seized. After John Proctor had been hanged, his son, Thorndike Proctor, who had been born to John and his second wife, Elizabeth Thorndike, purchased the Groton Farm from the Downings of London. He would later sell nearly half of it to his half-brother Benjamin. For eight generations the Proctors continued to reside on the farm un 1851. It is unknown when Elizabeth Proctor died.